Not only can acid reflux be uncomfortable, it can also be damaging to your teeth. Acid reflux can be painful, and in most cases, it’s accompanied by heartburn that is even more uncomfortable. In the United States, over seven million people suffer from acid reflux symptoms, and if you’re one of them, it’s important to know how that it can affect your teeth so that you can take he proper precautions. The stomach acid that leads to heartburn and nausea can also greatly compromise enamel causing acid erosion of the teeth. Luckily, there are steps you can take to protect your teeth from the harmful effects of acid reflux. #1. Get the right treatment for your acid reflux. If your acid reflux is chronic, known as GERD, over the counter heartburn medications may not be enough to control your symptoms. It is best to consult with your doctor to discuss all the medication options to treat your acid reflux, which could not only help you feel better, but also prevent you from having issues with your teeth. If you have GERD, it is especially critical to maintain your dental checkup schedule. Your dentist can monitor for the early warning signs of dental erosion, treat the damage and help you figure out an action plan for preventing further damage. #3. Steer clear of acidic foods and drinks. What you eat can affect the severity and frequency of your acid reflux episodes. If you are able to completely eliminate acidic foods and drinks from your diet, you may even be able to say goodbye to your acid reflux for good. Be aware that citrus, dairy, fried foods, fatty meat, spicy foods, caffeine and chocolate can make your reflux worse and be careful not to consume too much of these foods. #4. Rinse your mouth after you’ve had an episode. It’s important to rinse the acid out of your mouth every time you have an acid reflux episode. To neutralize the acid in your mouth, you could try rinsing with a pH balancing mouthwash or a mixture or water and baking soda. You could also dissolve an antacid tablet on your tongue to reduce the acid in your mouth. #5. Brush with a fluoride toothpaste. When shopping for toothpaste, pick one that contains fluoride. Fluoride is an important ingredient for strengthening your enamel and preventing it from eroding away due to acid reflux. Keep in mind that you should rinse first, then brush your teeth if you’ve had an acidic taste in your mouth from reflux. This ensures that you have removed the acid from your teeth properly. When you chew sugarless gum, it increases the saliva in your mouth, which can help to protect your teeth from the acid. Acid reflux is not only painful and uncomfortable, it could spell trouble for your teeth, but as you can see, there are ways to mitigate the effects of acid reflux. 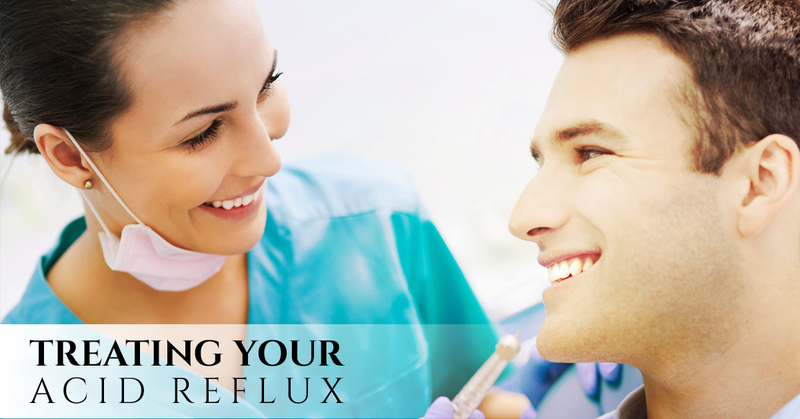 If you have acid reflux, be sure to visit our dentist in Lawrence for your examination and dental cleaning. Our dentist can help you protect your teeth and catch the early signs of tooth erosion before it becomes a severe problem. Contact us today to schedule your appointment.